King Trishanku went to his guru Vashistha and said, "please help me perform a ritual by which I can go to heaven while I am still alive." Vashistha replied, "It is a law that no living person can go to heaven. Go and do good deeds and you will go to heaven when you die." Disappointed, Trishanku requested Vashistha's sons to help him. They got angry, "How can you ask us something that our father has already denied? We curse you to become old." Trishanku immediately turned old." He went to the great sage, Vishwamitra, for help. Vishwamitra promised to fulfil his wish. Vishwamitra performed a big Yajna; he chanted mantras and made offerings to gods. But the gods did not want anyone to break a law and enter heaven alive; they did not accept the offerings. Vishwamitra was furious and said , "I will send you to heaven by my own powers. Rise Trishanku. " As he said this, Trishanku began to rise and reached the gates of heaven. The gods stopped him and said, "You can't come to heaven alive. Fall back to earth." Trishanku started falling back. Vishwamitra said, "Don't fall! Stay!" And Trishanjku hung between heaven and earth. Then Vishwamitra said, " I will create another heaven for Trishanku ." He created the stars and as he was going to create another Indra, the gods stopped him saying , "Don't do this unnatural thing. " By this time, Vishwamitra had cooled down. He agreed to stop but said, "I have to keep my promise. Trishanku will live with these stars." 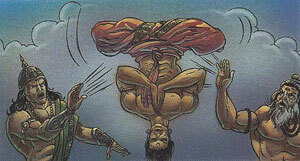 The gods agreed but declared that Trishanku would live in his heaven upside down.